MISSION STATEMENT: St. Charles Parish School in Hartland, Wisconsin nourishes and grows a vibrant Catholic community committed to innovation, responsiveness and compassion as it prepares and challenges students in their intellectual, spiritual and moral lives. As we are all looking forward to the upcoming break and time with family, I want to wish everyone a very blessed Easter. Please enjoy the time together and safe travels to those who are traveling near and far. On behalf of the teachers and staff, thank you for allowing us to walk in the footsteps of Christ with your children and the opportunities to grow in our faith with them each and every day. 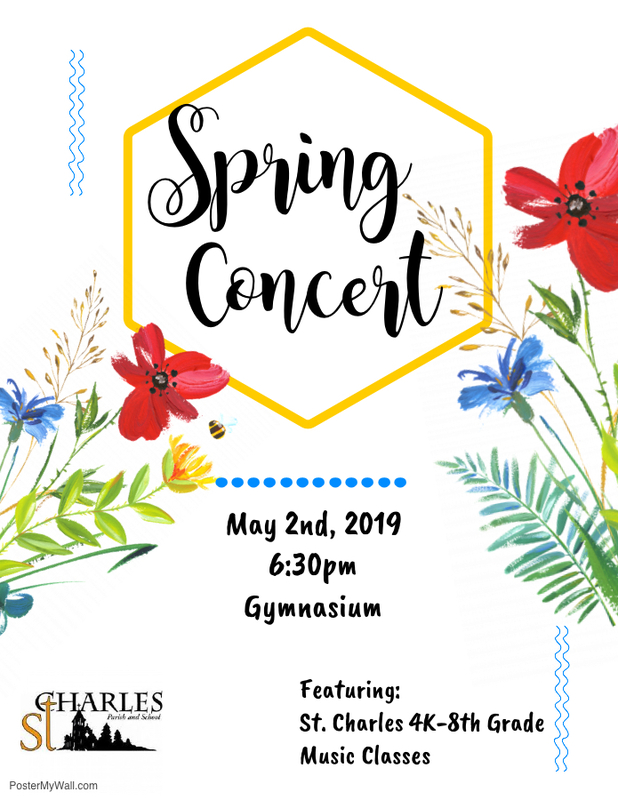 Spring Concert: The Spring Concert is Thursday, May 2nd at 6:30 pm in the gym. When we return from break, Ms. Stalteri and the students will only have a couple of days to rehearse before the big night so please make sure your children are present in school. I am very excited to see our students perform, especially with some new instruments. Doors will open at 6:00 pm. See you there! VIP Day: Our Very Important Person Day (formerly known as Grandparents Day) is set for Friday, May 3. If you would like the School Office to mail an invitation to your child's VIP guest please email Christina Holmes and send her the home address of your guests. Also if you're able to volunteer on VIP Day or bring in food please click HERE. We need help to make this St. Charles signature event a shining success. Please remember this is an Early Release Day with school ending at 11:45 am. We need to know which students are leaving with their relatives. Take a minute to print the permission slip and fill it out and return it to your child's teacher by Thursday, April 18. VIP Day is one of the best days of the year because we show off our school to family members and friends. The morning begins with Mass at 8:30 am followed by a light breakfast in the Borromeo Room. Students then show their VIP guests all around the school making stops at the 4th Grade Folk Fair in the Parish Hall,the library, classrooms, the Science Fair display, gym and much more. Remember this event takes place the very week we return to school after Easter Break. St. Charles Parish Holy Week Schedule is HERE. Also remember the Easter Egg Hunt following the 11 am Mass on Easter Day. Learn more HERE. Principal for the Day: The following is a report from Bobby Walsh, a 6th Grader who was Principal for the Day last week. "Principal for the day was so much fun! It was very exciting and though it was busy, the tasks I had to do were fun I got to participate in a meeting, observe the classes, make announcements, handle recess duty and I even read a book to 5K. I also ate Falbo=E2=80=99s pizza with some friends in the office. My experience as principal for the day was great! Thank you so much Mr. Garvey and staff for helping me with my "job=E2=80=9D! Have a safe and wonderful Easter break and we will see you back and ready to go on Monday, April 29th! * Mother's Day Gifts: Looking for ideas for Mother's Day which is Sunday, May 12? Consider purchasing gifts from Artrsonia, the website which is where your children's art pieces are located. Create notepads, pictures, mouse pads and other items with your child's art front and center. Or maybe put together a book with your child's artwork from the entire year. These are fun and unique gifts. Check out the website: www.artsonia.com. St. Charles receives a small donation from Artsonia for each item purchased. * Golf Outing Returns: Save the Date for the 19th Annual St Charles Parish and School Golf Outing to be held Sunday, June 2 at Ironwood Golf Course to support Athletics. Details about registration and sponsorships to follow but for now mark your calendars! For questions, please contact Ashley Lillesand (lillesandlaw@gmail.com). * Box Tops Drive: Send in General Mills Box Tops to your child's teacher as we will have one more collection before school is out the first week of June. So look for the box tops around your house, pass on the information to family members and send them in! * Summer Camps and Plans: Do you have plans for the summer for your kids? There are lots of options for kids with camps, classes and activities. Marquette, Divine Savior Holy Angels and Catholic Memorial High School offer a wide range of camps and classes. A simple list has been created on the school website as a resource guide for parents. St. Charles does not endorse any of the camps and is simply providing information. Click HERE to learn more about the classes. * Use ScripNow! on Amazon: Are you using ScripNow! when you make purchases on Amazon? Every time you place an order on Amazon.com (using Amazon Smile, of course, which is an easy and effortless St. Charles fundraiser) take two minutes to go out to Shopwithscrip.com, order your Amazon ScripNow!, wait less than a minute for the SCRIP to show up in your Dashboard, paste the code into your Amazon Gift Card space while checking out and woila! You=E2=80=99ve paid for your Amazon purchase using SCRIP and earned money for St. Charles Parish School twice! Look for more ways you can earn money for St. Charles on the school website under Parent Resources/Support St. Charles! Days Off In April: Easter Break runs from Friday, April 19 which is Good Friday and we return to school on Monday, April 29. Please note that Thursday, April 18 is an Early Release Day and classes end at 11:45 am for students in 5K through 8th Grade. Students in 3K and 4K are released at their regular time of 11:30 am.